So you’ve probably noticed there has been quite a large amount of desserts on Chelsea’s Messy Apron. I promise I’m not solely a dessert blog! 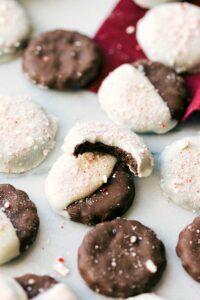 My brain has been bombarded with dozens of different ideas of holiday desserts and treats. 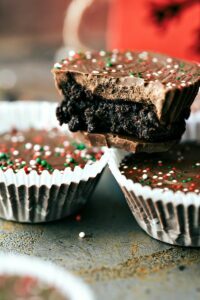 It’s becoming a problem when I’m waking up at 3 AM too excited to sleep because I thought of another dessert or treat that will be perfect to share with you all. And it’s just that time of the year… where baking and making goodies is the best possible activity to do when it is negative degrees outside and there are so many people you want to wish a Merry Christmas! 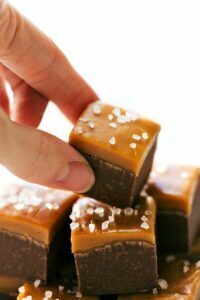 So here’s the thing about fudge, there are probably about a million gazillion fudge recipes on the internet, and while I can’t promise mine is the best, I can tell you that it only lasted about 5 minutes in my house. I also want to quickly say how important it is to use good quality chocolate. 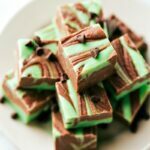 I wanted this fudge recipe to be easy, so I made it all microwavable. So you don’t have to worry about the stovetop and two pots of water and all that hassle. But that does mean, you need to be careful so you don’t burn the chocolate and most importantly use good high quality chocolate. I highly recommend Guittard or Ghirardelli. I haven’t tried this recipe with off-brand or cheaper chocolates, but I have tried to melt cheaper chocolates in the microwave before and the results were less than exciting. 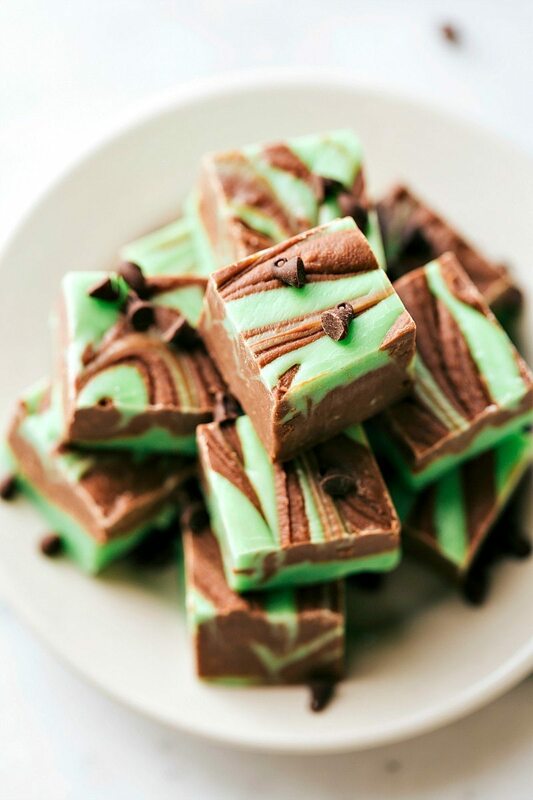 And with that said, I am going to stop talking writing, so you can get making this fudge. And wowing people with how DELICIOUS it is. Enjoy! Combine the milk chocolate chips with 1/2 of the can of sweetened condensed milk in a large microwaveable bowl. Microwave for 15 seconds, stir for 30 seconds, and then microwave for another 15-20 seconds. Stir for about 30-45 seconds or until the chocolate is melted. If it isn't melted all of the way, return it to the microwave for 20 more seconds. * Stir in the vanilla extract. 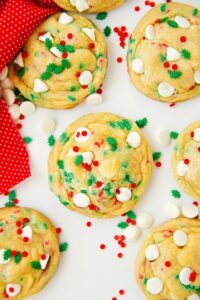 In another microwaveable bowl, combine white chocolate chips with the remaining sweetened condensed milk, peppermint extract, and green food coloring. Microwave for 15-20 seconds, stir for 30 seconds, and then microwave for another 15-20 seconds. Stir for about 30-45 seconds or until the chocolate is melted. If it isn't melted all of the way, return it to the microwave for 20 more seconds. Into the prepared pan, alternate spoonfuls of the mint white chocolate with the milk chocolate until both bowls of melted chocolates are all in the pan. Place the fudge in the fridge and let harden, typically about 4 hours. Pull out the fudge using the parchment overhang. Store in an airtight container -- best enjoyed within 2-3 days. Love the creative thought behind this fudge! Looks delicious! I love that this fudge has two flavors swirled together! And the shapes – so perfect for the holidays : ) I feel the same way with my blog this month – so many desserts! But it’s that time of the year and it’s just too fun to stop! Oh goodness, I could probably eat quite a few of these! There wouldn’t be any leftover for gifts. 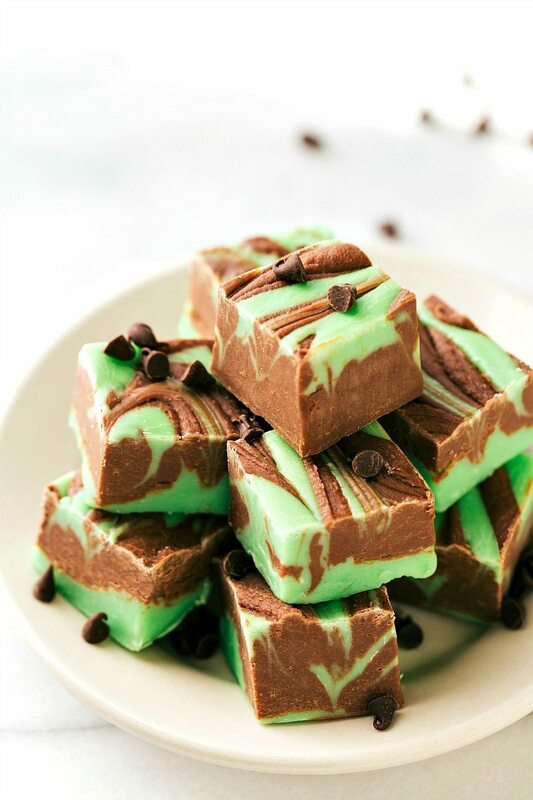 😉 Mint + chocolate is always a good combo. I love all the Christmas-y props and things you used in your photos! So cute! What is the weight or size of these chocolate bags and what do you mean about the can of condensed milk being “separated”? Does that just mean take out only the amount you need or does it have something to do with the texture inside the can? What size of condensed can of milk is needed for this? The above was meant to read I used to be able to buy this from a local store but they stopped selling this ages ago. I’m very pleased to see your recepie because it is so simple. It will be a great suppose for my gorgeous hard working mum. Thank you. By the way the time here in the UK is 20:28. Have you ever frozen this? Looks delicious! Sorry, I’ve never tried freezing this fudge. Wish I could be of more help! I can’t wait to try this, it’s in the fridge now! Question… the chocolate mixture was SO MUCH thicker than the mint… So the knife swirl wasn’t really possible. Why do you think that is?